Anna Menzel '15, (from left), Marie-Fatima Hyacinthe '14, and Nicolas Jofre '13 serve coffee at the Cabot Cafe located in the basement of Cabot House. 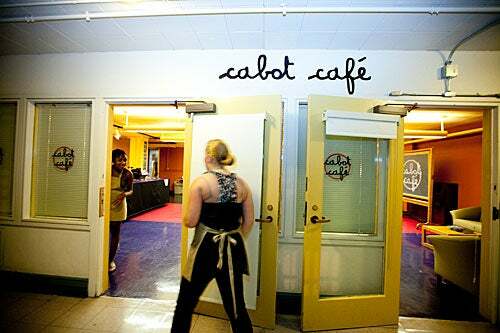 As 8 p.m. approaches, three baristas scurry about Cabot Café in the Radcliffe Quadrangle. 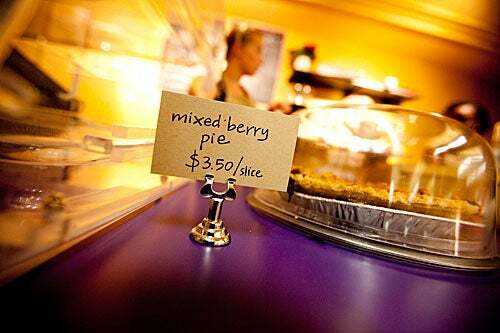 They arrange fresh pastries on glass shelves, slice a gooey Mississippi mud pie, and unlock the doors. When they grind the coffee, the delicious smell fills the space, and students from around the quad filter in with friends or homework or both. Before the official opening of the café on Sept. 25, general manager Jesse Kaplan ’13 and four other managers taught the dozen new hires how to run the shop. The intensive, weeklong “barista boot camp” paid off; any of the dozen undergraduate baristas can smoothly run the shop alone on a given night. 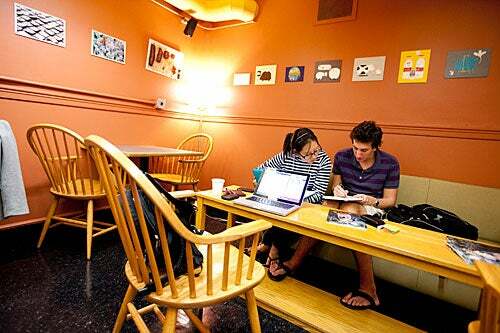 Kaplan and his classmates/business partners — Laura Hinton, Chandan Lodha, Daniel Lynch, and Carolyn Stein — last spring proposed their idea of opening a coffee shop in the basement of Cabot to House Masters Rakesh and Stephanie Khurana. Both masters have extensive business experience, and Rakesh is a Harvard Business School professor. The five received hearty encouragement. Says Kaplan, “We would never have been able to pursue this project without the House masters’ continual enthusiasm and support.” They borrowed grant money from the House to launch a spring preview and later to buy machinery and supplies. 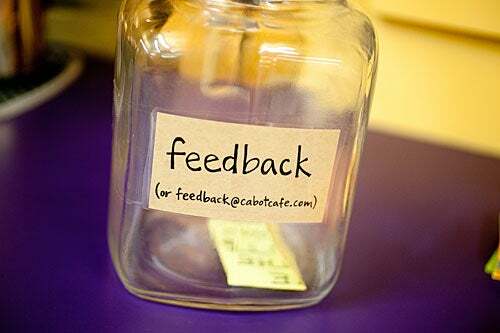 In the feedback jar beside the espresso machine is one question: “Where will the profits go?” Kaplan’s response is business minded: The organizers will invest the profits back into the café. They plan to renovate a back room into a food preparation area, buy new furniture, and install better lighting. 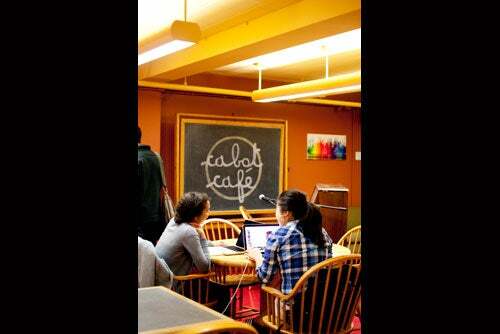 They also plan to host nights featuring slam poetry, open microphones, games, and musical performances. For now, students sit at tables huddled over homework, sipping cappuccinos, and taking part in a business endeavor that Kaplan says “has been incredibly rewarding” and will not be his last entrepreneurial venture. At 8 p.m., Anna Menzel '15 (right) and Marie-Fatima Hyacinthe '14 open Cabot Cafe, which is located in Cabot House's basement. The cafe closes at midnight. but that suits these studiers just fine. 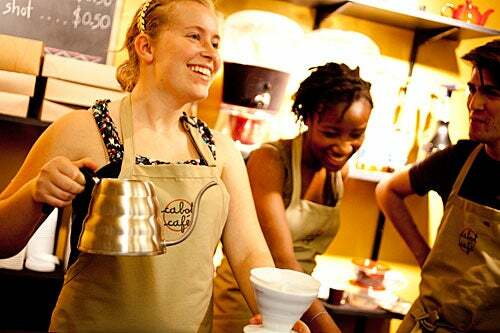 Baristas Anna Menzel '15 (from left), Marie-Fatima Hyacinthe '14, and Nicolas Jofre '13 serve up caffeinated delights. 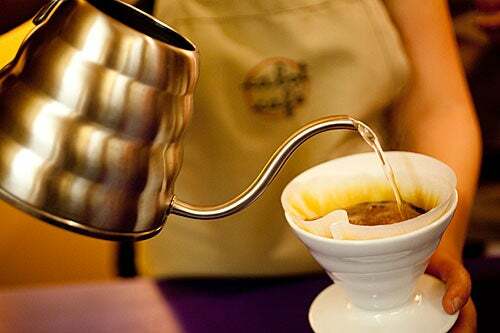 Anna Menzel '15 makes a "pour-over" coffee at Cabot Cafe. Jesse Kaplan '13 (right) studies with Min Hwang '13. Kaplan is one of five Cabot residents that have partnered to open this basement cafe. 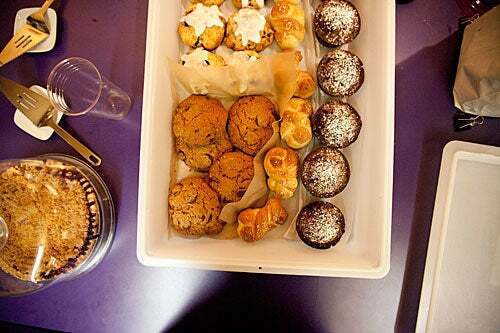 Who can resist a pastry? 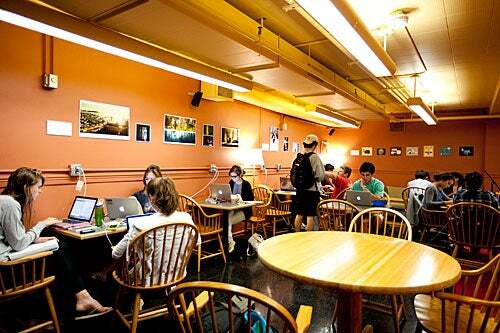 Though it may be new, business is booming in Cabot Cafe. Anna Menzel '15 assists customers in the background ... while this pie waits, but certainly not for long. Daniel Lynch '13 (left) is the facilities manager and Laura Hinton '13 does public relations and events for the cafe. They are two of the five Cabot residents behind the new cafe. 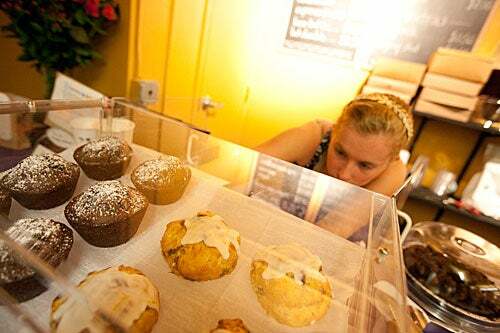 Anna Menzel '15 keeps the pastries stocked. Mississippi mud pie? Gautam Kumar '13 receives a sweet slice from Anna Menzel '15 (right) and Marie-Fatima Hyacinthe '14. Justin Walker (left) and Muhammed Konneh (center) are interns in Year Up, a one-year training and education program that provides urban youth in Greater Boston with hands-on skill development and internship opportunities, working to close the opportunity divide by providing urban young adults with the skills and support to reach their professional potential. On the right is Jared Thomas, their manager.